The Rise & Thrive OSJ Radio Hour has “Gone to the Dogs” and we are just fine with that! Saturdays 9:05 a.m. on The Eagle, KZLS 1640AM or listen in on the OSJ app and website “Home Page” anytime! Guests in studio: Tracy Burch & Sylvia DeLeon, Owners of Groomer A Go Go Pet Market & Salon. Both Tracy & Sylvia’s hearts have been in the rescue service of animals for as long as they both have lived. Tracy & Sylvia view the precious pet as the client and when a client comes in with their owner … The client and owner are individually shown the lay out of the salon that the dog/client will be go through during his or her spa treatment … much like how you and I are treated at our own salon appointments. The client is bathed, hand blow dried immediately after bathing and then hand delivered to the groomer. 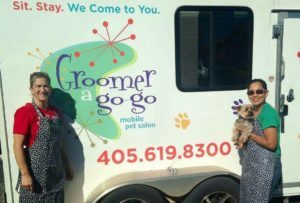 Once your pet (Groomer A Go Go’s client) has been placed in Sylvia or Tracy’s hands, they are followed through from start to finish and the owner is notified that their pet has completed their spa experience at Groomer A Go Go. A full service pet salon, healthy pet food, treats for dogs & cat foods along with some of the most unique pet accessories, I have ever laid my eyes & hands on. Oh & Yes, they now have the Pet CBD Oils & Treats that are a Natural Healthy approach for a myriad of pet issues. Groomer A Go Go is the only place my doggies (Tippy & Sadie) will ever go … which needs to be your family’s plan as well … You (I Promise) will be singing their praises as well. Visit their Facebook page here.